Verm-X Pellets for Rabbits, Guinea Pigs and Hamsters have been carefully formulated to give domestic Lagomorphs, Rodents and Mustelidae a natural method of intestinal hygiene control. Highly palatable and packed full of high-quality fibre, the Verm-X pellets have been designed so that they can be gnawed, which brings the added benefit of aiding healthy and strong teeth. 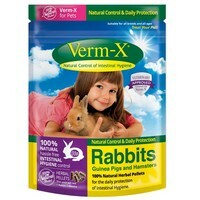 Verm-X is naturally suited to pet’s with sensitive stomachs as they are gentle on your pet’s gut and digestive system. Feed every day throughout the year for continual effectiveness. Start use at 2 months of age, feed half the amount between 2-4 months. Feed the full amount from 4 months.